A number of people have asked me how to create curve-stitch designs using PostScript. I have invariably given fragmentary instructions with little expectation that my correspondents would actually have the patience to produce designs of their own with this arcane tool. A recent request from a teacher, however, led me to think that, given a bit more guidance, a few dedicated souls might give my technique a try. Rather than responding at length in a personalized reply to everyone who contacts me, I thought it might be more efficient to provide some instructions on my Web site once and for all. No doubt, this, too, will generate questions, but it might also lead others to produce some innovative designs. Background. My earliest curve-stitch designs were done with pencil and paper. I produced serious designs by trading my pencil for drafting pens and India ink. All the designs shown on Lionel Deimel’s Farrago are produced by computer using the PostScript Language, however. (PostScript is a registered trademark of Adobe Systems Incorporated.) PostScript is a so-called page description language now widely used for desktop and commercial publishing. It first achieved prominence as the language interpreted by Apple’s LaserWriter printer in 1985. PostScript came along about 20 years after I had given up the tedium of drawing designs with pen and ink. Although most of the PostScript code generated today is produced by computer software to drive devices such as printers, PostScript is a full-blown programming language that can be used by a human programmer. What makes PostScript attractive for producing curve-stitch designs is its extensive repertoire of graphics operators and the ability of PostScript interpreters to reproduce lines, whether curved or straight, at high resolutions. Tools. The standard introduction to PostScript has long been PostScript Language Tutorial and Cookbook, which is available as a PDF here. Reading this book and following the exercises in it is a good way to learn PostScript basics. Eventually, particularly for newer features that have been incorporated into the PostScript language, one has to consult the PostScript Language Reference. Happily, it should not be necessary to read all of this 900+ page book. PostScript is written in ordinary, printable characters, so programs can be composed with an ordinary text editor, such as Microsoft Notepad. (This discussion assumes the use of a Windows platform, but the procedures I describe can be carried out in an analogous way on other platforms.) Do not use a word processor, such as Microsoft Word, which saves documents in a special format. Curve-stitch designs can be distributed as PDF files, but this is not necessarily the best format to use in certain contexts. 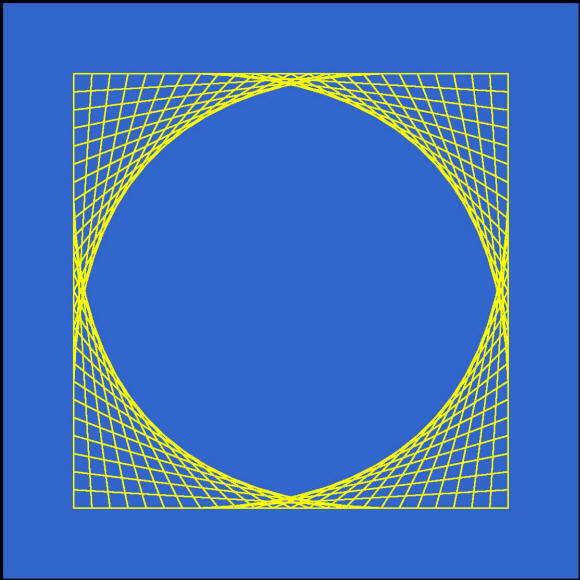 The curve-stitch designs on my Web site are GIF, JPEG, or PNG files. Because I have Adobe Acrobat on my computer, I use it to save page images in graphic formats, such as JPG or TIF. GSView cannot do this, and neither does the free Adobe Reader. In a pinch, one can take a screen shot of a design, displayed in GSView or Adobe Reader, say, and paste it into Microsoft Paint or some other graphics program. (The currently active window can be copied to the clipboard using Alt+Print Screen. The Print Screen key alone copies the entire screen to the clipboard.) In the graphics editor, the screen image can be cropped to show only the desired design, and the result can be saved in any of several graphic formats. One can actually produce designs directly with Inkscape, though this can be even more tedious than hand-coding PostScript. Inkscape, however, can generate SVG or PNG (Portable Network Graphics) files from a PDF file. If the PDF file has come from a hand-coded PostScript file, vector information is preserved, and the SVG file from Inkscape will be as good as one drawn in Inkscape directly. I have found that PNG files generated by Inkscape are very good. %%Copyright 2007 by Lionel Deimel. All rights reserved. % The procedure draws the design and strokes it. % origin and moving counterclockwise around the square. % Define dimensions of square and area around square. Effectively, this made the page size the same size as the figure drawn by the program. Without this line, the figure would have appeared at the lower left of a letter-size page. From Acrobat, I saved the PDF as a JPG file, which, reduced in size, appears above. I could also have used GSView to generate a PDF. In this case, one has to define the page size under User Defined on the Media menu. (Click here to see the PDF file produced by GSView.) Alternative ways of producing a graphic file from the PostScript source are described above. Also, cropping the image can be done later in the production process, in Inkscape, for example. I hope that this discussion will discourage the fainthearted and encourage the bold. I have no intention of established a Famous PostScript Programmers’ School, but I will try to help any serious student get unstuck if he or she tries to use PostScript and runs into the proverbial brick wall. My e-mail address is below.